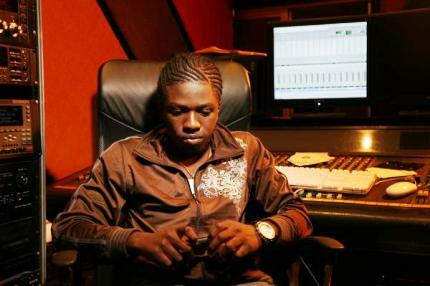 Ky-mani brought his hottah Konfrontation band, featuring two female singers who were simply entertaining to watch. Ky-mani kicked off with his father’s “Who the Cap Fit” and “Concrete Jungle,” which got the crowd fired up. He talked to the crowd and wished all the mother’s dem a happy mother’s day, which delivered a roar from all the women there. 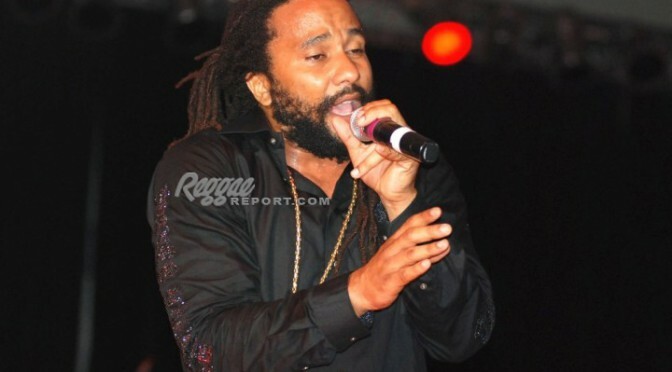 He turned out a super-energetic performance while delivering songs off his latest album, Maestro. Fans sang along with “Keepers of the Light” and “Love Over All” while Ky-mani danced and twirled around the very small stage. 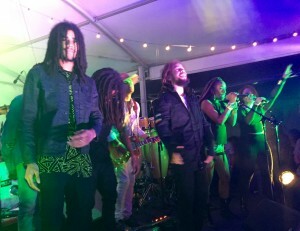 Skip, Yohan, Jo Mersa Marley came out for final encore. 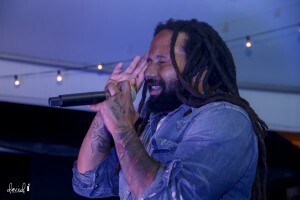 Following “Iron Lion Zion,” Ky-mani was joined by the Marley Next Generation — that would be Jo Mersa, Skip Marley, Yohan Marley, and more — for an extended version of “One Love,” where each grandson had an opportunity to show off their growing stage prowess. 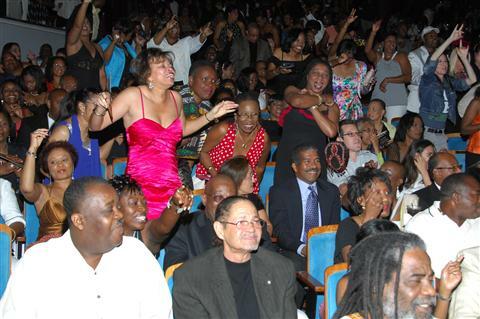 The crowd loved it! 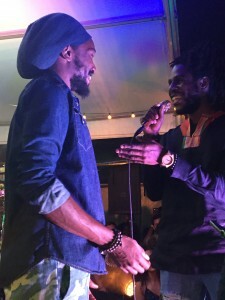 A slight set change gave some the chance to circulate, eat some authentic Jamaican cuisine, buy some Ites-green-& gold merch from the Kulcha Shok booth, while others – those stage front – were not leaving, they were waiting for the man of the hour, Chronixx. Stepping on stage with his talented Zincfence band, Chronixx greeted fans with closed eyes and a raised hand to give praises to the Most High HIM Haile Selassie I. 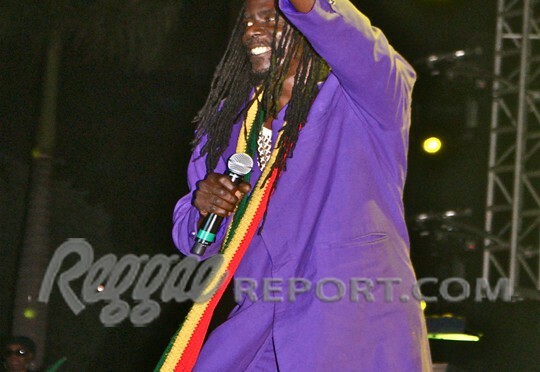 The roots have branches and Chronixx is at the top of the tree. Steve Coore, son of Third World’s Cat Coore, proved that the “fruit doesn’t fall far from the tree” with his exemplary guitar playing. Just think of every song you’ve heard on the radio, and Chronixx performed it, from “Ghetto People” to “Here Comes Trouble.” His style is a mix of roots-Marley style, dancehall, and a bit of R&B. A real treat came in the middle of his set when he brought out Kabaka Pyramid for a surprise performance. 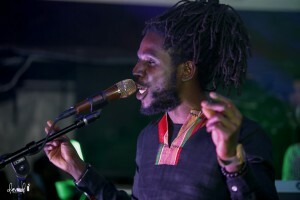 Although not quite as energetic as the seasoned Ky-mani, Chronixx connects with his audience at times with closed eyes or an almost trance-like gaze. And then he smiles, and the crowd is in the palm of his hand. It was a roots rockin’ night in the Yard. 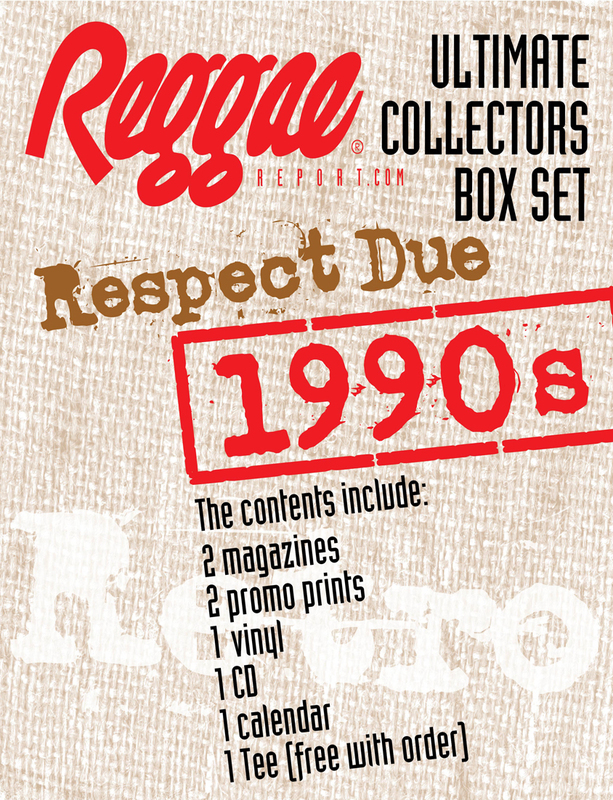 Generations of fans came together for the same reason – to have a good time listening and dancing to the best in Reggae music today. Epic show, fi real, and we have to give thanks to House of Marley and host Kulcha Shok for bringing this Get Together to our own backyard.